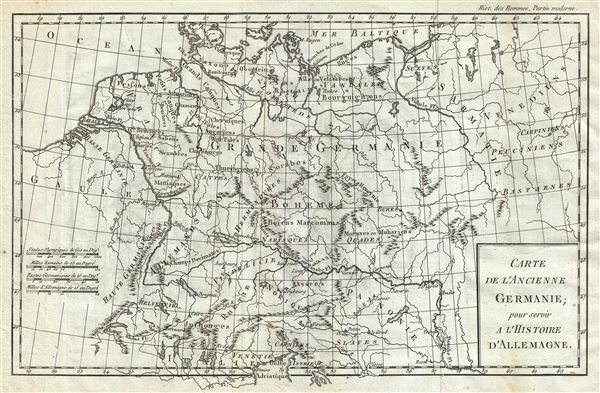 This is a fine 1782 map of Ancient Germany by Jean- Baptiste-Claude Delisle de Sales. Centered on Bohemia, the map covers the lands of the Germanic people prior to the fall of the Roman Empire, from modern day Denmark to the Adriatic Sea and from France to Lithuania. Several important cities and towns are identified throughout, along with rivers, lakes and other topography. Mountains are beautifully rendered in profile. …they affirm Germania to be a recent word, lately bestowed. For those who first passed the Rhine and expulsed the Gauls, and are now named Tungrians, were then called Germani. And thus by degrees the name of a tribe prevailed, not that of the nation; so that by an appellation at first occasioned by fear and conquest, they afterwards chose to be distinguished, and assuming a name lately invented were universally called Germani . Very good. Minor wear along original fold lines. Original platemark visible. Minor worm holes visible in lower quadrants. Blank on verso.